Preparation often breaks or makes legal battles. Most evidence without support can be picked apart or marginalized. IP Audit Trails are designed to help combat this problem. Provides a neutral dated “audit trail” of the invention, development, creation, compilation, modification, addition and deletion of these materials. Establishes, protects and verifies patent rights, copyrights, trade secrets, confidential information, etc. This can be critically important to the outcome or resolution of litigation or other disputes. The parties settling a dispute. For example, a software development and license agreement archived software (including source code), documentation of trade secrets, and other materials to precisely define the critical subject matter of the agreement. Any claims of future infringement (or non infringement) by a party of the other party’s rights can be judged with reference to the archived materials. Documents, evidences and independently corroborates intellectual property, technology, inventions, software, data, works of authorship, products, methods, tests, etc. 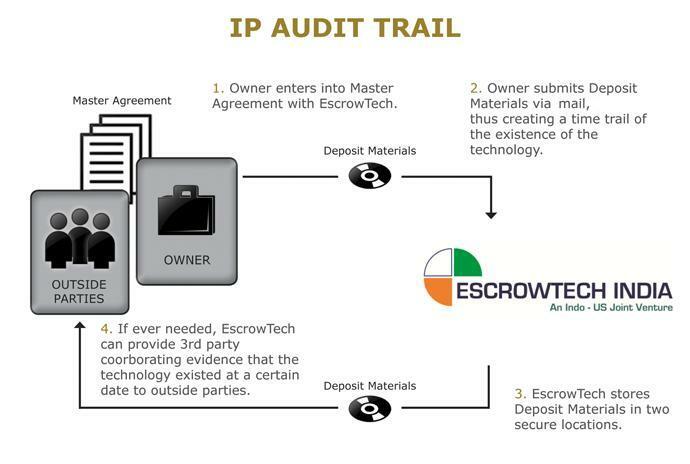 The IP Audit Trail Service allows a person or company (referred to as the “Owner”) to deposit “Deposit Materials” with EscrowTech India to create a chronological trail documenting the creation and existence of intellectual property, technology, inventions, software, data, works of authorship, products, methods, tests, and other rights of the Owner. These Deposit Materials are deposited periodically with EscrowTech India and then held by EscrowTech India in a Depository established for the Owner. EscrowTech India dates and confirms the receipt of these Deposit Materials to independently corroborate their existence and content as of the date of deposit. Whenever needed, EscrowTech India provides the originals or copies of the Deposit Materials to Owner or its designee. The “Deposit Materials” are the materials and items which Owner elects to deposit with EscrowTech India for purposes of the Audit Trail. The “Deposit Materials” may include documents, notebooks, records, drawings, information, works of authorship, computer programs, source code, listings, databases, encryption keys, passwords, web site content, CD ROMs, samples, prototypes, devices, products, and almost any other items or materials which may represent or embody intellectual property, technology, trade secrets, inventions, data and/or other rights of Owner. WHY USE THE IP AUDIT TRAIL SERVICE? This Service is designed to help our clients document and protect their intellectual property and other rights. Independent corroboration by a trusted authority such as EscrowTech India of the deposited Deposit Materials can be of significant value in legal disputes and may even be determinative of the outcome of litigation challenging our clients’ ownership of intellectual property or other rights. A company with the foresight or prudence to utilize this Service can be at a significant advantage over a challenger who has failed to prepare. This advantage can prove to be valuable in settlement negotiations, mediation, arbitration or litigation. By scheduling periodic deposits, the Owner disciplines itself to better document and establish protection for its intellectual property and technology. Without a formal program, this is often neglected or uncoordinated and subsequent retrieval months or years later for litigation or other purposes becomes difficult or impossible. The Service also provides for the security, preservation and recovery of mission critical or important materials, information, data, encryption keys, passwords, etc. HOW DOES THE IP AUDIT TRAIL SERVICE APPLY TO PATENT RIGHTS? Under the patent laws, the ability to establish and corroborate “conception of the invention” and an “actual reduction to practice of the invention” can be critical in a dispute with other companies or inventors claiming to be the first to invent and therefore entitled to the patent. Documents, drawings, invention disclosures, working prototypes, computer programs (for software inventions), and other materials deposited with EscrowTech India can corroborate our client’s claims of first inventorship. These Deposit Materials can show conception of the invention or can be in the form of an actual reduction to practice, e.g., a working sample or prototype of the invention. Without adequate corroboration, patent rights can be lost to another person or company who may be a competitor or who may license the patent rights to a competitor! HOW DOES THE IP AUDIT TRAIL SERVICE APPLY TO TRADE SECRETS AND CONFIDENTIAL INFORMATION? In litigation or other disputes involving trade secrets or confidential information, or other challenges to ownership or rights in proprietary technology, it may be critical to establish that certain trade secrets, information, data or technologies were in Owner’s possession prior to certain dates or events. EscrowTech India stands willing and able to produce the documented and dated Deposit Materials received from the Owner, to evidence the Owner’s claim that it was in possession of the critical trade secrets, information, data or other technologies at least as of the date of deposit. Independent corroboration from EscrowTech India lends credibility and evidence to the Owner’s claims. HOW CAN THE IP AUDIT TRAIL SERVICE HELP AN OWNER IN THE CONTEXT OF NON-DISCLOSURE AGREEMENTS? Example #1: Non-Disclosure Agreement (“NDA”) – Owner Discloses Confidential Information to another Person or Company. In this example, Owner enters into an NDA with another person or company and discloses confidential information to the other person or company. Typically, an NDA does little or nothing to identify or document the specific confidential information being disclosed. Months or years later, it may become disputed as to whether or not specific information was actually disclosed by or proprietary to Owner. The other person or company may claim that the disputed information did not originate with or belong to Owner, i.e., that it was the other person’s or company’s information. The credibility and strength of Owner’s case in such a dispute will be greatly enhanced if Owner can produce through EscrowTech India corroborated and dated evidence that such information was in fact in Owner’s possession prior to the date of disclosure to the other person or company and prior to any date of possession that can be established by the other person or company. We suggest that the Owner include in the NDA a statement to the effect that the confidential information disclosed under the NDA is part of the Deposit Materials deposited with EscrowTech India under the IP Audit Trail Service. As any experienced intellectual property attorney knows, disclosing parties typically or often forget this writing and marking requirement or do an incomplete job in meeting the requirement. This can result in a loss of protection under the NDA because the information disclosed does not meet the NDA’s definition of, or requirements for, confidential information. A very unpleasant surprise! We suggest that the Owner include in the NDA a statement to the effect that the writing and marking requirements of the NDA will be deemed satisfied for any disclosed information that the Owner can document to be included among the Deposit Materials held and dated by EscrowTech India prior to the date of the NDA or the date of disclosure to the other person or company. Example #2: Non-Disclosure Agreement (“NDA”) – Another Person or Company Discloses Information to Owner. EscrowTech India’s IP Audit Trail Service can be invaluable in protecting the Owner as a recipient of “already known” information under an NDA. Through independent and dated corroboration by EscrowTech India, Owner will be able to show that information already in its possession is not subject to the confidentiality obligations of the NDA. An inability to make this case, can have serious consequences in a legal dispute involving an NDA. HOW DOES THE AUDIT TRAIL SERVICE APPLY TO COPYRIGHTS? 1. Authorship, Ownership and Independent Creation. Deposit Materials deposited with EscrowTech India can include virtually any form of copyrightable subject matter (any “work of authorship”), e.g., documents, drawings, computer programs, data bases, photographs, and other works of authorship. The date of deposit with EscrowTech India is evidence that authorship (or creation) of the work must have predated the date of deposit. Software development projects can be tracked, showing dates and stages of development. All of this can be important in the context of legal disputes concerning authorship of copyrightable works and therefore ownership of the copyrights. It can be used to establish prior or independent authorship of works. It can be useful in supporting both claims and defenses. 2. The Copyright Registration Problem for Software. independent record of the complete source code to which the copyright pertains. In the event of copyright infringement litigation or for other reasons it may be necessary to credibly establish the content of the complete source code. Will a court or other parties accept the uncorroborated “word” of the software company that the source code produced months or years later by the company is authentic, accurate and complete? Will the company be able to produce a complete copy of the original source code if the software has been changed and enhanced over time? The IP Audit Trail Service can solve the problem. At the time the Owner files its copyright application, the Owner includes in the Deposit Materials deposited with EscrowTech India a copy of the application together with a complete listing of the corresponding source code. When the certificate of copyright registration issues, it or a copy thereof can be provided by Owner to EscrowTech India for inclusion with the source code. When called upon by Owner, EscrowTech India can independently establish and verify the complete source code corresponding to the copyright registration. HOW ARE SECURITY AND PROTECTION OF INTELLECTUAL PROPERTY AND TECHNOLOGY ENHANCED? An Owner can use this Service for security and protection of mission critical or important materials, information, data, encryption keys, passwords, etc. By depositing Deposit Materials with EscrowTech India, a company has a secure and independent back-up of its trade secrets, information, data and technology. This provides an extra level of protection against theft, sabotage, data alteration, accidental loss, etc. Also, by implementing a formal program to deposit Deposit Materials with EscrowTech India, a company disciplines itself and its employees to create a good record that documents and evidences its intellectual property. HOW DOES THIS IP AUDIT TRAIL SERVICE APPLY TO THE PROBLEM OF ROGUE EMPLOYEES? A company embarks on the development of a significant new computer technology. Each of the key employees assigned to this project signs an agreement to keep the technology confidential and to assign to the company the patent rights and other intellectual property created by the employee within the scope of employment. Suddenly and unexpectedly, after many months of development, these key employees leave the company and establish a new company to commercialize similar (or the same) technology or the next generation thereof. The employees claim they haven’t taken any of the source code or the company’s trade secrets or intellectual property with them, and are developing their competing technology without use of any of the company’s source code, trade secrets or intellectual property. The company alleges breach of confidentiality, misappropriation of trade secrets, and infringement of intellectual property. The company believes that the new technology must be based on or embody trade secrets created by its former employees before they left the company, but is unable to find documents or other evidence describing in technical detail what the company’s trade secrets are. It is difficult to support a claim of trade secret misappropriation without being able to state what the trade secrets are. The company also desires to file patent applications claiming the inventions it believes were created by its former employees before they left the company. But again, there is no detailed documentation or other evidence of the inventions. The former employees maintain that the key inventions were created after they left the company, and that the company has no claim to patent applications filed by them after leaving the company. In fact, the former employees threaten to enforce their own patent rights against the company! Similar problems apply to copyrights in the software. The former employees claim the software was written after leaving the company. The company cannot find current or final copies of the software to document ownership of software copyrights or to establish copyright infringement by the former employees. Finally, when the company’s replacement employees attempt to pick up where the former employees left off, they find little documentation or other materials to help them. The development environment is missing or outdated. Valuable knowledge and know how are lost. Even if the source code can be found, there may be different undated and unnumbered versions. The company even fears that the software left behind may be sabotaged with errors, defects, viruses or other harmful code. The inability of the company to produce evidence that these trade secrets, patentable inventions and copyrightable software were developed by the former employees during their employment with the company creates serious problems. To the extent that the company does produce documents and other evidence, they are tainted by allegations of the former employees that such documents and evidence are manufactured or doctored after the fact and therefore lack credibility. Obviously, if the company had participated in EscrowTech India’s IP Audit Trail Service it would have been in a much better position. EscrowTech India could have produced documented and dated Deposit Materials supporting the company’s case. This would have provided credible evidence from an independent source that corroborates the company’s case. The Deposit Materials could also have provided a back-up or replacement to lost, altered or sabotaged materials and facilitated a successful transition of the project to replacement employees. WHAT COOPERATION CAN A CLIENT EXPECT FROM ESCROWTECH INDIA IN THE EVENT OF A DISPUTE? EscrowTech India will not only produce documented and dated Deposit Materials, but will testify in support of the procedures, protections, confidentiality, security, and credibility of the IP Audit Trail Service, the integrity of the contents of the Deposit Materials, and the documented dates assigned to the Deposit Materials. An EscrowTech India representative will be available at all stages of settlement negotiations, mediation, arbitration, and litigation. WHEN AND HOW OFTEN ARE DEPOSIT MATERIALS DEPOSITED? This is decided by Owner, not EscrowTech India. EscrowTech India recommends a periodic schedule of deposits, e.g., monthly or quarterly, so that new inventions, improvements, etc. are covered. Depending on the situation, annual deposits may be sufficient. In some cases, a single one-time deposit may be all that is needed. No matter what periodic schedule is selected, a key development or other special circumstance may justify or even require an interim deposit prior to the next regularly scheduled deposit. The frequency with which Owner makes deposits affects the annual fee payable to EscrowTech India. WHERE ARE DEPOSIT MATERIALS STORED? All Deposit Materials should be provided to EscrowTech India is held in EscrowTech India’s dedicated on-site storage facility. HOW CAN INVESTORS AND LENDERS TAKE ADVANTAGE OF THE SERVICE? In connection with an investment in or loan to a company, an investor or lender may require the company to participate in the IP Audit Trail Service. A special IP Audit Trail Service is used for this purpose and is referred to as the IP Collateral and Investment Protection Service. The investor or lender is given the right to inspect Deposit Materials and to receive releases or copies of Deposit Materials from the Depository. The company would not be allowed to have Deposit Materials removed from the Depository without the investor’s or lender’s approval. In this manner, the investor or lender can better document and secure the intellectual property or technology on which it is basing an investment or loan or that is subsequently created with the money invested in or loaned to the company. It makes it more difficult for the founders or employees of the company to walk away from the company (leaving the investor or lender with a failed company) only to begin over again with a new company that takes advantage of the previous company’s intellectual property and technology. Please see our description of the IP Collateral and Investment Protection Service.